I post lots of embroidery patterns and tutorials here all the time, but it's been awhile since I did a quick "Getting Started" post so here you are. Are you ready to learn hand embroidery? You've come to the right place. Even if you've never embroidered in your life, you can learn in just a few easy steps! Embroidery is fun, relaxing and very versatile. I know you'll love it! Just read on to learn the basics and you'll be all set to stitch up something awesome. Step 1. Gather your supplies. You'll need an embroidery needle (I buy packs of different sizes and pick my favorite), floss (pick your favorite colors! ), hoop (a 6 inch wood or plastic one is a good one to start with) and fabric. You can embroider on almost any fabric, try embellishing your clothes, dish towels, pillowcases, anything! You can find all of these things at your local craft store, or maybe even in your closet. Step 2. Stretch your fabric onto the hoop, make sure it's tight and smooth. Cut a length of floss about 12 inches long, thread the needle and then tie a knot in one end. Pull the needle and floss through the fabric from the back until the knot catches. Now push the needle back down through a little ways away and pull the floss tightly to the fabric. You've made a Straight Stitch! Step 3. Keep making Straight Stitches in a line. You can make them all the same length, short or long, far apart, or very close together to get the effect you want. Straight Stitches in a line like this are called the Running Stitch. When you're done with your line, tie a knot on the back and start with another color. Step 4. Now make a few Straight Stitches side by side, close together, going back and forth. This is a Satin Stitch and it's great for solid shapes. Step 5. 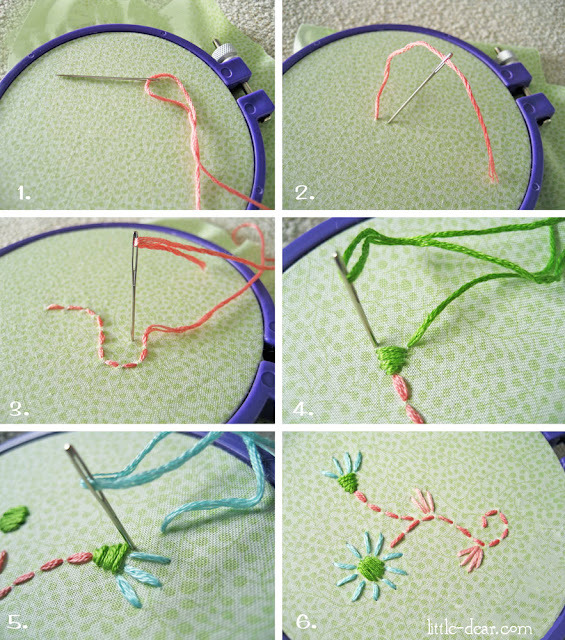 Use a third color to make a few more Straight Stitches in flower petal and leaf shapes. Step 6. You're done! It's really easy to embroidery pretty designs freehand with just a couple easy stitches. Play around and see what else you can come up with! Ready for more? Check out my Doodle Stitching books for lots of fun patterns and instructions! And visit littledear.etsy.com and pick yourself out a unique kit, sampler or PDF pattern download.